As part of leaving Bloomington for college and my brand new start, I’d made a careful decision to never ever tell anyone about my sister, Fern. Back in those college days I never spoke of her and seldom thought of her….Though I was only five when she disappeared from my life, I do remember her. I remember her sharply — her smell and touch, scattered images of her face, her ears, her chin, her eyes. Her arms, her feet, her fingers. – We Are All Completely Beside Ourselves, by Karen Joy Fowler. In Karen Joy Fowler’s novel, We Are All Completely Beside Ourselves, Rosemary Cooke and her twin sister, Fern, do everything together – toddle around in diapers, share ice cream cones, play in the snow. One morning Rosemary and her brother awaken to find Fern gone, sent away by their parents. In the 1970s, a handful of behavioral psychologists thought it would be interesting to raise a chimpanzee as a human child, in adoptive human families. In part, they wanted to see if chimps could learn to communicate by using American Sign Language, thinking that might shed light on human language acquisition. 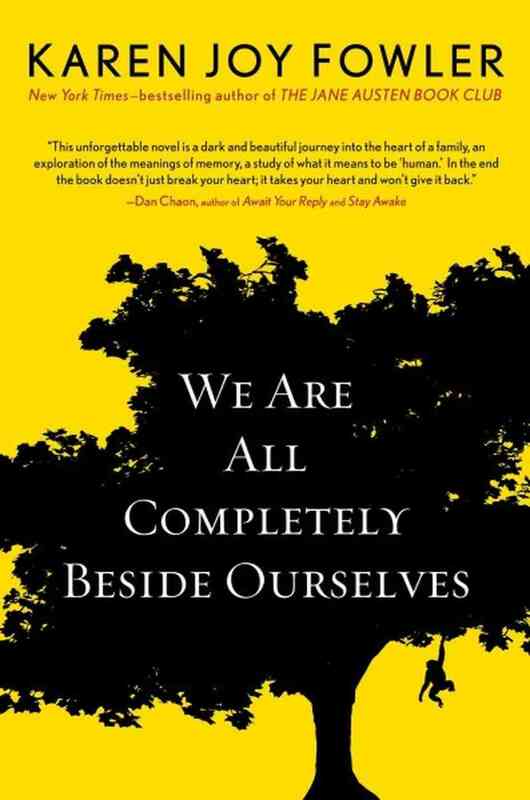 We Are All Completely Beside Ourselves is a fictional account of one such experiment and the disastrous consequences. No one in the Clarke family comes away unscathed – not Rosemary, not her brother, not her mother or her behavioral psychologist father. And certainly not Fern. Rosemary is too young to understand the circumstances behind Fern’s banishment, which was mishandled by her parents (no surprise there), and she blocks out much of what happened. This is relatively easy to do, since her shattered mother and father don’t speak of Fern. Rosemary’s brother never forgives his parents for removing their little sister from the family with such confounding callousness; Rosemary wonders if someday she’ll be sent away, too. Friendless, chronically unable to get close to people, never feeling like she fits in, Rosemary must eventually piece together her past and then figure out where to go from there. I read We Are All Completely Beside Ourselves with a great deal of admiration for Fowler’s storytelling skills, yet also with a kind of dread. I wanted to know why Fern was sent away and what became of her. And yet, I didn’t want to know. Along the way, I learned some of the history of the use of animals in research. Though there is still much controversy, thanks to the Animal Welfare Act and similar policies, there is now a more enlightened approach to the treatment of animals used in research and testing. Whenever possible, non-animal alternatives are found. One of my medical librarian colleagues specializes in searching the biomedical literature for alternatives to animal testing for research. The National Institutes of Health announced this summer it will greatly reduce the use of chimpanzees in NIH funded research. Many NIH chimps will be sent to the Federal Sanctuary System in Shreveport, Louisiana. We Are All Completely Beside Ourselves is an extraordinary story. If you’ve read Karen Joy Fowler’s book or any of the above, tell us what you think in the comments. Beautiful review, Valorie! This looks like a very fascinating book. I have read one book by Karen Joy Fowler – ‘The Jane Austen Book Club’ – which I liked very much and now after reading your review of her latest book I feel that she is getting better and better. If you hadn’t revealed that Fern was a chimpanzee, I would have never guessed. I will look for this book. Thanks for this wonderful review. Thanks, Vishy. I can’t believe I haven’t read The Jane Austen Book Club yet – it’s on my list! Thanks for stopping by! I hope you enjoy reading ‘The Jane Austen Book Club’, Valorie. I liked it very much. I actually saw the movie version and I liked it so much that I went and read the book after that. If you like movies based on books, you might like the movie too. I was interested in this book before I read your review and now I REALLY want to check it out. 🙂 Sounds absolutely fascinating! Beautifully written, as always. There’s just too many wonderful sounding books out there to read! How will I find the time?